He's been lighting up German football since arriving at Borussia Dortmund in 2010, but do you know everything there is to know about Bayern Munich's goal-getter extraordinaire Robert Lewandowski? Born in Warsaw on 21 August 1988, Lewandowski was given the first name Robert by his parents, so that it would be easy for foreigners to pronounce when he became an international star! A little presumptuous, perhaps, but there was certainly plenty of sporting potential in his DNA – father Krzysztof was a Polish judo champion who also played football for second-division Hutnik Warsaw, while mother Iwona played professional volleyball, as would older sister Milena. “My husband knew we were going to raise a footballer," Iwona recalled. "That's why he is Robert. Travelling through Europe, Krzysztof witnessed how important it would be to have an internationally recognisable name.” Sadly, Lewandowski's father didn't live to see his prediction come true – he died in 2005, three years before his son made his top-flight debut in the Polish Ekstraklasa. Long before his stunning five-goal salvo off the bench against Wolfsburg in September 2015, Lewandowski had shown he had all the makings of a supersub, although most of his coaches quickly realised that he had no business being left out of their starting XIs. In July 2008, the then 19-year-old netted from the bench in his Lech debut, a UEFA Cup qualifier against Khazar Lankaran of Azerbaijan. In August, he needed just four minutes to score with an audacious backheel in his first league appearance against GKS Belchatow, while a month later he grabbed his first international goal for Poland, eight minutes after coming on in a World Cup qualifier against San Marino. "I dedicate this goal to my father," Lewandowski said after the game. Let's go back to that Wolfsburg game. With his Bayern side trailing 1-0 at half-time, Pep Guardiola brought Lewandowski on for Thiago, and what followed would earn him no fewer than four Guinness World Records. He netted in the 51st, 52nd, 55th, 57th and 60th minute, scoring the most goals by a Bundesliga substitute (5), as well as the quickest three-goal (3'22"), four-goal (5'42") and five-goal (8'59") hauls in league history. It was one of two career-defining performances for Lewandowski, following his virtuoso display for Dortmund against Real Madrid in April 2013, when he became the first player to score four times in a UEFA Champions League semi-final and truly announced himself on the world stage. The last time Poland reached the FIFA World Cup, in 2006, Lewandowski was coping with the disappointment of being released by hometown club Legia Warsaw and preparing for life in the third tier with Znicz. How times have changed. The Bayern frontman was on scorching form in qualifying for Russia 2018, helping his country claim top spot in Group E and finishing the campaign with a new European record of 16 goals. Ever since he was given the captain's armband by coach Adam Nawalka in late 2014, he has become his nation's talisman. He equalled David Healy's record of 13 goals in qualifying for UEFA Euro 2016, where he scored two minutes into the quarter-final as Poland were beaten by eventual champions Portugal on penalties. Last October, he became the country's all-time leading scorer with 51 goals (in 91 appearances), while the influential football magazine Pilka Nozna has named him Player of the Year for the past seven years running. Such is his popularity back home, the residents of southern town Kuznia Raciborska successfully petitioned to name a street in his honour. Lewandowski might never have played in the Bundesliga at all if it were not for the infamous eruption of the Eyjafjallajökull volcano in 2010. Shortly before completing his move to Dortmund, the high-flying Lech striker was invited to visit Blackburn Rovers, with manager Sam Allardyce even travelling out to Poland to meet him personally. "I thought Allardyce was a good guy, a very good coach," Lewandowski told The Daily Mail. "He was prepared to take a young player who was something new and might be something special." However, the disruption to air travel that spring meant that Lewandowski was unable to fly to the UK, and by the time the ash settled he had chosen North Rhine-Westphalia over Lancashire. "The flight was booked but we couldn't leave. Did it change my life? Yeah, maybe! If I'd gone there then perhaps I would have stayed. But then I found out about Dortmund, and that was the next step." Lewandowski has played for some of the world's best coaches at Bayern – Pep Guardiola, Carlo Ancelotti and now Jupp Heynckes – but he credits former Dortmund and current Liverpool boss Jürgen Klopp with moulding him into a true world-class talent. "He was the one who gave me belief," Lewandowski explained. "In the first three or four months in training, we would have this game, him against the striker, a bet between me and him. In the first few sessions he was always winning – but after that, not so much. It was €50 a game and by the end I had a positive balance! But I saw for the first time how important it was to train. Jürgen Klopp made me the footballer I am. I haven't changed anything at Bayern, I'm just using different weapons in my artillery. But I shaped my career in Dortmund." 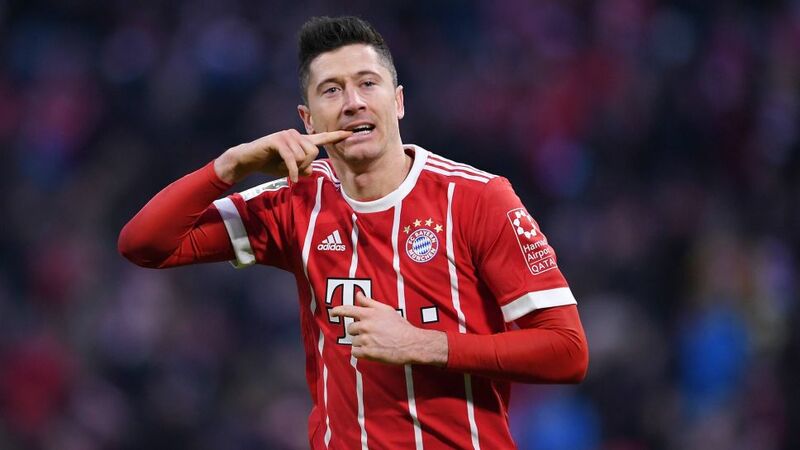 Since the start of the 2011/12 season, only Barcelona's Lionel Messi and Real Madrid's Cristiano Ronaldo have scored more goals than Lewandowski, which goes some way to explaining why he has almost as many individual trophies to his name as he does team honours. As well as his seven Player of the Year awards in Poland, he has finished as the league's top scorer five times in 11 seasons. Winner of the Bundesliga Torjägerkanone in 2014 and 2016, he looks nailed on to become just the fourth player – after Gerd Müller, Karl-Heinz Rummenigge and Ulf Kirsten – to lift the top scorer's cannon for a third time. He is also on course for a fourth straight Bundesliga title with the Bavarian giants – after the two he won with Dortmund – and has claimed a domestic Cup crown with each of his three top-flight clubs. Only the Champions League has eluded him thus far. He was on the losing side as Bayern edged BVB at Wembley in 2013, but he could still get his hands on Europe's top prize in 2017/18, with Heynckes' side chasing another Bundesliga, DFB Cup and Champions League treble. "Lewandowski is the most professional player I have ever met," Guardiola once said. "He thinks about the right food, sleep and training, 24 hours a day. He's always there, never injured, because he focuses on these things, and he knows what's important to be in the best condition." Like any world-class player, the Poland captain has worked incredibly hard to remain at the peak of his powers, instead of simply relying on his natural talent. He clearly has one eye on the future as well, having completed a Bachelor's degree in Physical Education the day after Poland secured their place at the 2018 World Cup. Defending a thesis based on his own career, Lewandowski was given the highest possible grade by the marking panel at the Warsaw School of Education in Sport, rounding out a decade of study in style. He is also the co-owner of a successful venture capital fund back in Poland. All in all, it's been a pretty successful decade for a man who only turns 30 on 21 August – a birthday he shares with fellow trailblazers Usain Bolt, the fastest man on the planet, and Wilt Chamberlain, the only basketball player to score 100 points in an NBA game. But in so many ways, Robert Lewandowski stands alone – and he will surely go down as one of the all-time Bundesliga greats.